Power cabling in being installed in the new power conduit along Rt. 110. 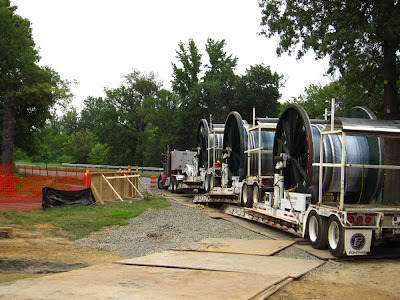 The power line will connect to Rosslyn's new Radnor Heights power substation. The new power line should reduce risks of power outages in the area. Some speculate that the new power line could be a prelude to Rosslyn taking powerful moves to regain historic territory. Given Rosslyn's distinguished military tradition, some even fear military action. But don't worry, that's not the Arlington way.